"It was such a surprising and unexpected discovery," said co-lead author Dr. Irja Elliott Donaghue, who first found that the therapeutic protein NT3, a factor that promotes the growth of nerve cells, was slowly released when just mixed into a Jello-like substance that also contained nanoparticles. "Our first thought was, 'What could be happening to cause this?'" Proteins hold enormous promise to treat chronic conditions and irreversible injuries — for example, human growth hormone is encapsulated in these tiny polymeric particles, and used to treat children with stunted growth. In order to avoid repeated injections or daily pills, researchers use complicated strategies both to deliver proteins to their site of action, and to ensure they're released over a long enough period of time to have a beneficial effect. 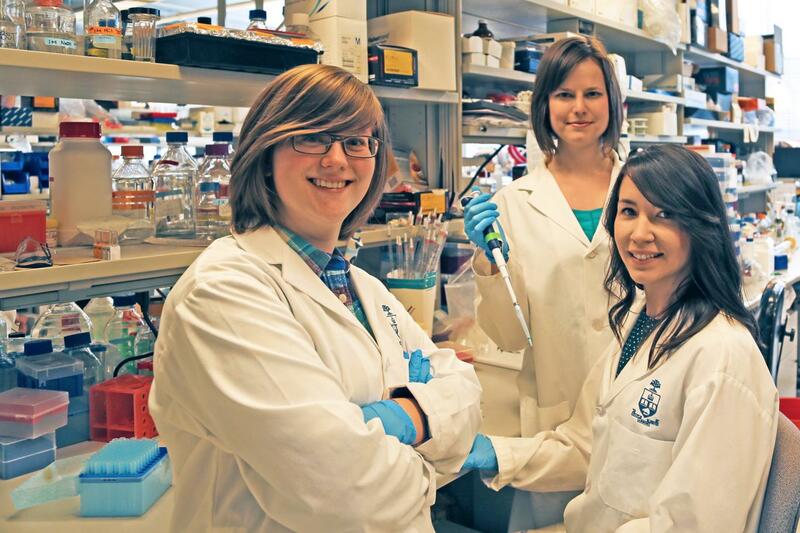 "This is really exciting from a translational perspective," said Jaclyn Obermeyer. "Having a simpler, more reliable fabrication process leaves less room for complications with scale-up for clinical use." The three lead authors, Elliott Donoghue, Obermeyer and Dr. Malgosia Pakulska have shown that to get the desired controlled release, proteins only need to be alongside the PLGA nanoparticles, not inside them. Their work was published today in the journal Science Advances. "We think that this could speed up the path for protein-based drugs to get to the clinic," said Elliott Donaghue. The mechanism for this encapsulation-free controlled release is surprisingly elegant. Shoichet's group mixes the proteins and nanoparticles in a Jello-like substance called a hydrogel, which keeps them localized when injected at the site of injury. The positively charged proteins and negatively charged nanoparticles naturally stick together. As the nanoparticles break down they make the solution more acidic, weakening the attraction and letting the proteins break free. "We are particularly excited to show long-term, controlled protein release by simply controlling the electrostatic interactions between proteins and polymeric nanobeads," said Shoichet. "By manipulating the pH of the solution, the size and number of nanoparticles, we can control release of bioactive proteins. This has already changed and simplified the protein release strategies that we are pursuing in pre-clinical models of disease in the brain and spinal cord." "We've learned how to control this simple phenomena," Pakulska said. "Our next question is whether we can do the opposite–design a similar release system for positively charged nanoparticles and negatively charged proteins."